Sometimes a subject settles itself into the foreground of one’s thoughts and, with the calm certitude of a cat on a windowsill, refuses to budge. Such a subject for us over the last few months has been the translation of poetry. Translation is forever cropping up these days in our discoveries of poets new to us whose work we admire, writing in French, Dutch, Welsh, or Farsi. It has become a growing interest of Crispin’s in his own writing, and is lately a subject for discussion with friends who are also involved in such work. While in the midst of several projects with the press which will take some time to complete, it is always pleasing to have a project to hand which allows us to work a day or two at a time away from bigger books, pari passu, to refresh the vision and flex the muscles. A suite of broadsheets seemed a good idea. The idea was all the more plausible since we happened to have a number of lovely hand-made papers in stock, although not enough of any one of them for an edition of a book. There was, however, sufficient of each for a run of a broadsheet. 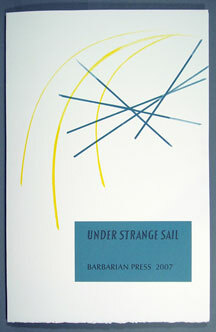 We are therefore pleased to offer Under Strange Sail. This is a suite of a dozen separately designed broadsheets. The languages represented include classical Greek, Estonian, Dutch, Farsi, French, & German, the poets ranging from Sappho and Pindar to contemporary poets like Doris Kareva, Willem van Toorn, and Fereydoun Faryad, including along the way Georg Trakl, Rainer Maria Rilke, and others. The translators include Albert Moritz, Robert Bringhurst, Scott King, Francis Jones, Manfred Meurer, and Crispin Elsted. One of Ronsard’s sonnets is translated by John Pass, 2006 winner of the Governor General’s Award for poetry; a recently discovered new poem by the Nobel Prize-winning Italian poet Eugenio Montale is translated for the first time into English by John Francis Phillimore, and three of Doris Kareva’s poems are translated from Estonian by an acquaintance of many years, Toomas Ilves, who just last October, by happy coincidence, was elected President of Estonia. We received our copy of [Under Strange Sail] yesterday and were delighted with the assemblage. We especially appreciated inclusion of the wood engraving by Petar Lazarov; among our favorite artists. Thank you and congratulations on another impressive publication. [Under Strange Sail] has sailed safely to El Portal. And we are awestruck and charmed by it. As usual each element is perfectly & harmoniously realized. ... Have savoured several sheets and look forward to the others. Am particularly delighted by your choices of display types for the (to me) exotic personal names. Indeed each of the Displays is a cause for revel (a revelation?). I did not know what to expect and was rather stunned by the sumptuous folder. What an achievement! Ronsard, Rilke, and Sappho are favorites but the others are so close that I am sure I'll keep changing my allegiances. 1. If I ever need something wrapped to withstand atomic attack, floods, and whatever I shall come to you. It took some considerable time to open the package. 2. That said, the effort was worth it. It is as delightful to the eye as Founts & Circumstance. So I shall spend several nights savouring the pleasures of this your latest production. Another gem added to the collection. Under Strange Sail is absolutely ravishing! Fascinating poems, breathtaking design, stunning variety of type and papers within a pleasing coherence. Thanks so much for it! ... I love the rococo R at the very heart of my encounter with M. Ronsard whom I have Englished as you so rightly put it, unmercifully. But only after he’d Frenched me. . . Utterly charming presentation. Today I will caringly and hungrily go fore and aft about the craft in its entirety, fondling the rigging and whatever lovely forms may be surprised in their bunks. The poems are printed in a variety of typefaces on vintage Barcham Green papers as well as on new hand-made sheets from Canada and the Czech Republic. The suite is contained in a folded and decorated portfolio of heavy waterleaf paper, and includes a title sheet, a colophon, and notes on the poets and translators. Peter Lazarov (subject of Endgrain Editions 3) has provided a ‘visual translation,’ in the form of a wood engraving, of a sonnet by Ronsard. The usual discounts for subscribers, patrons, and the trade will, of course, apply. 100 sets for sale, & 15 additional sets hors commerce. Please Note: British, American, European, and Asian clients will be charged at the prevailing currency exchange rate at the time of invoicing.